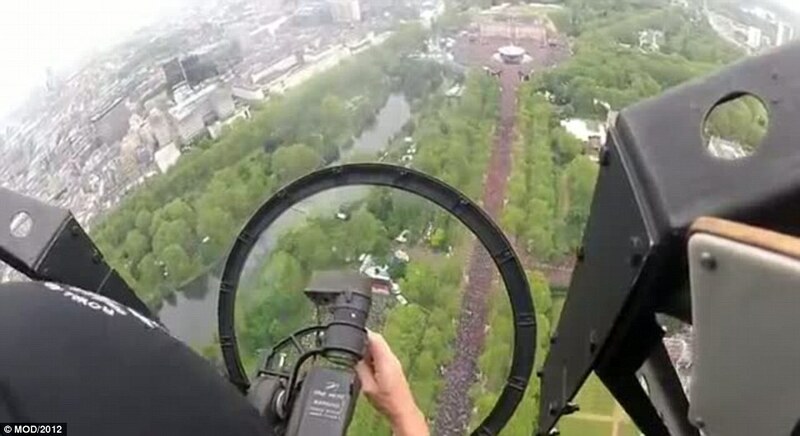 Incredible footage has been released showing the bird’s eye view enjoyed by crew aboard a Lancaster bomber flying over London for the Queen’s Diamond Jubilee celebrations. 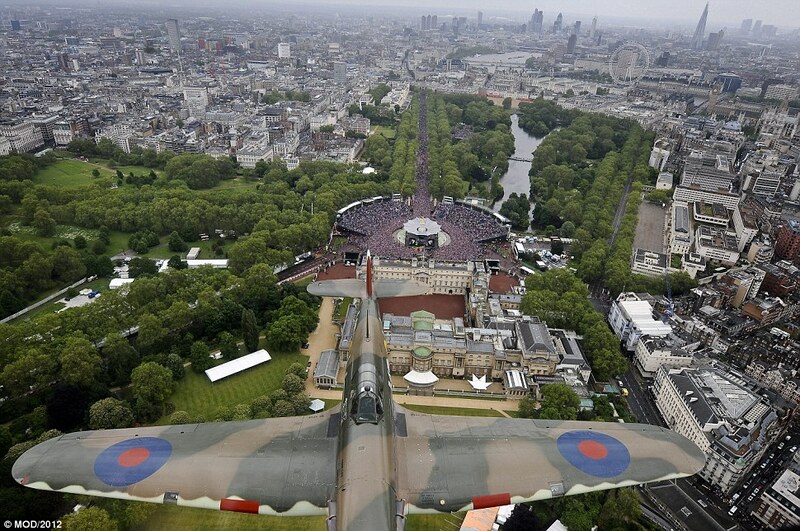 The aeroplane, which is part of the RAF’s Battle of Britain Memorial Flight (BBMF), flew in formation with aircraft including a Spitfire, Hurricane and Dakota transport aircraft down The Mall, followed by the Red Arrows aerobatic team – to the delight of crowds and the Royal Family at Buckingham Palace below. 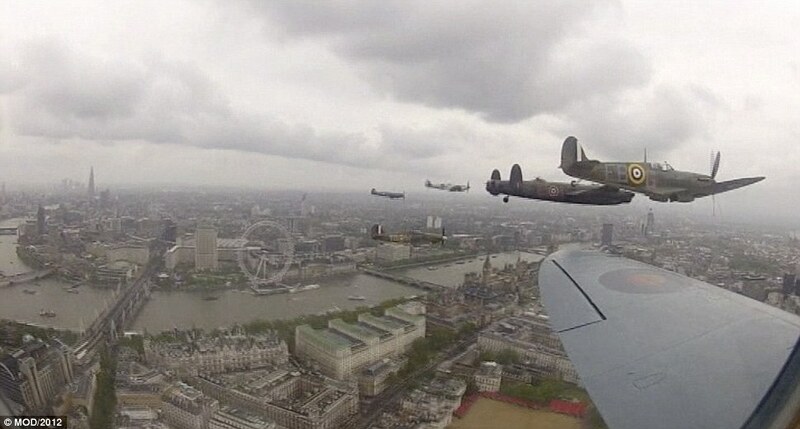 As well as preserving a fleet of priceless aircraft and keeping them in tip-top flying condition, the BBMF reminds the nation of the sacrifices made during World War Two. 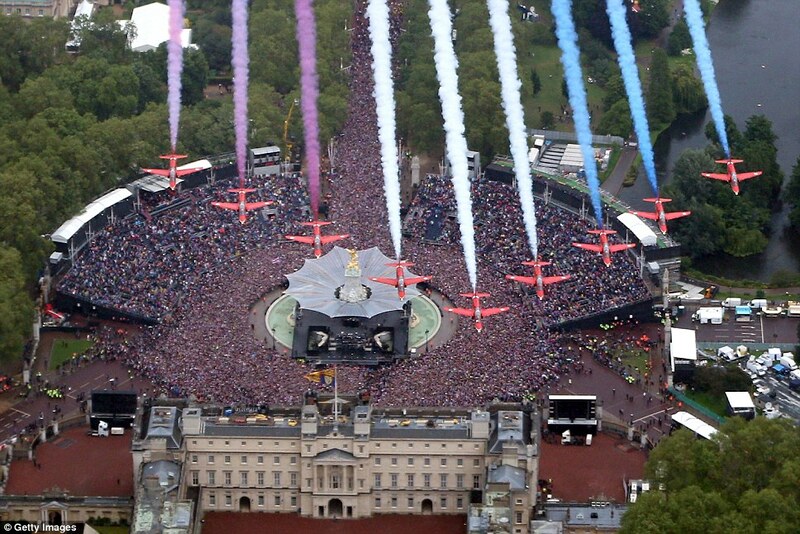 Based at RAF Coningsby in Lincolnshire, many of its personnel, including pilots, are volunteers and the flight costs about £3m a year to run. 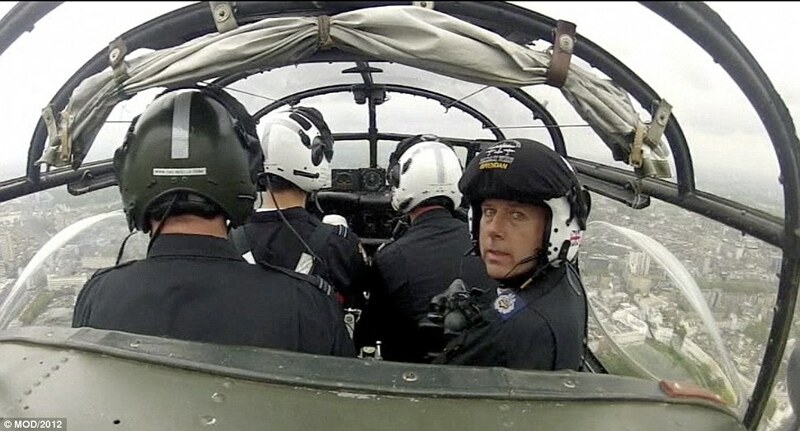 Squadron Leader Ian Smith, who is in charge of the BBMF, is the only permanent member, with all of the remaining pilots, navigators, air engineers and other crew coming from different airbases and ordinarily flying several different types of aircraft; from Typhoon fighters to the huge Hercules transport plane. The aircrew give up three out of every four weekends from May to the end of September in order to fly and display the historic aircraft. 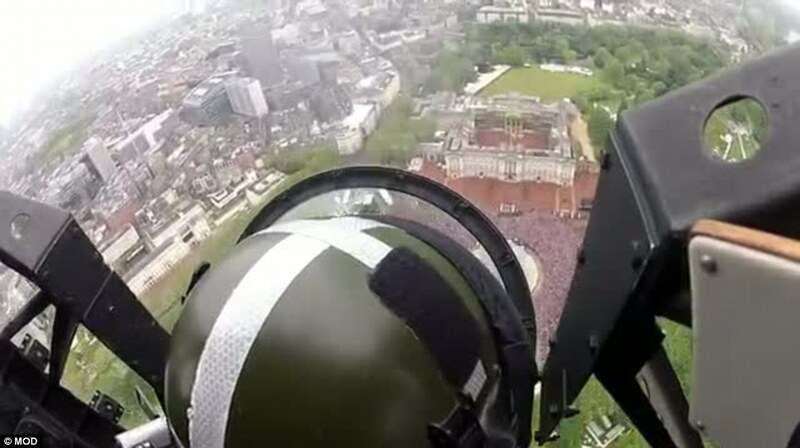 The footage, released by the Ministry of Defence, shows just how tight a fit it can be aboard a vintage aircraft, with the crew – clearly eager to catch a glimpse of the Queen – taking up most of the available space. 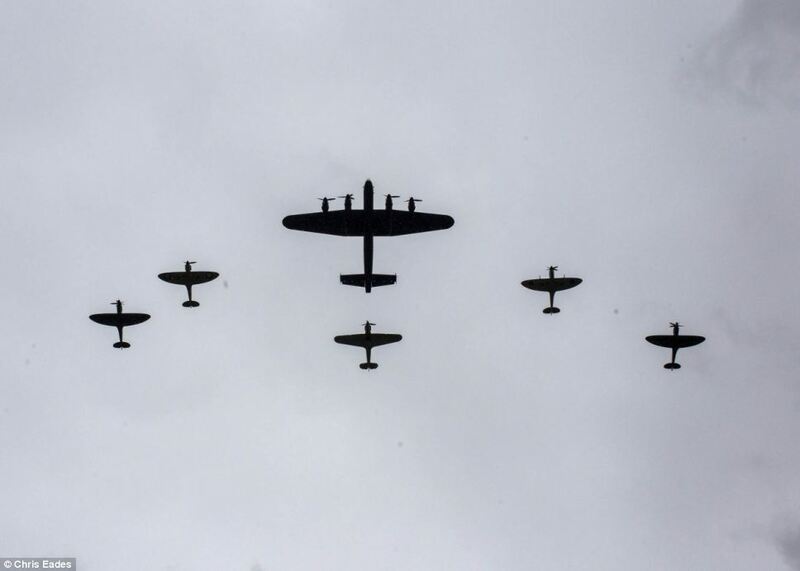 The historic flight includes the Lancaster, which first saw service in 1942. The ‘Lanc’ was the most famous of the Second World War bombers and gained renown for its starring role in the momentous ‘Dambuster’ raid on Germany’s Ruhr Valley in 1943. Carrying a payload of 22,000lb and with a 1,500-mile range, the RAF bomber wreaked havoc on Germany. Some 3,500 were lost in a_ction during the war. 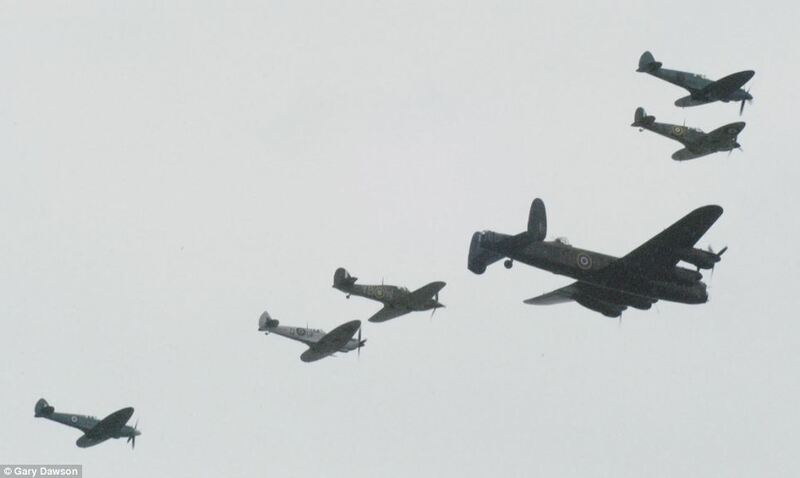 Hurricane single-seater fighters played a crucial role in the Battle of Britain. Heavier and slower than the Spitfire, it was considered the RAF’s ‘workhorse’ against the Luftwaffe. A remarkable total of 14,533 Hurricanes were built and served operationally on every day and in every theatre during the war. Only 12 are still airworthy worldwide. 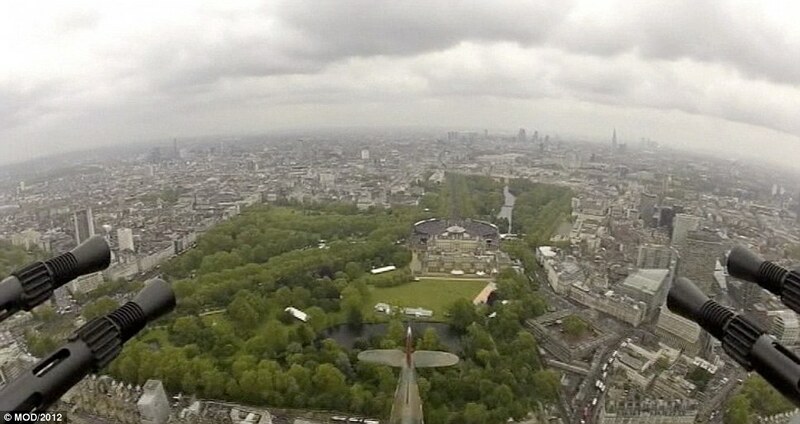 The Spitfire is the iconic fighter that won legendary status against the Luftwaffe in the Battle of Britain. It possessed atop speed of 378mph, an altitude of 35,000ft and armed with two 20mm cannons, four Browning machine guns and two 250lb bombs. One of the four that flew yesterday was P7350 – the oldest airworthy Spitfire in the world and the only one which actually fought in the Battle of Britain. It was shot up by a Messerschmitt 109 during combat in October 1940 but its wounded Polish pilot Ludwik Martel managed to crash-land it, wheels up, near Hastings. A Funny To Lighten The Day!